It’s so strange to have Easter so late this year. I feel like we should already be celebrating. However, despite the fact that the calendar says that Easter isn’t here yet, there is no reason that we shouldn’t be talking and teaching about it. Last week when I created the Farm Play Dough Pack, my kids kept asking me for different scenes. I had just bought some awesome clipart from Melonheadz Illustrations and immediately I wanted to make a scenery set for Easter. Another winner with my kids. Now, if you feel that kids shouldn’t use their imaginations in regards to stories from the Bible, this set is not for you. If, however, you want your kids to learn the stories of the Bible and be able to interact with their minds and bodies, you will love this set! I loved listening to my kids tell the resurrection story over and over as they used the scenery pieces. My kids loved it so much that my ten-year old actually made the scene that you see in this photo and she took the photo herself because she liked it so much. Didn’t she do a great job? A photographer in the making! All you need to do for this set is print, laminate, cut out and imagine! 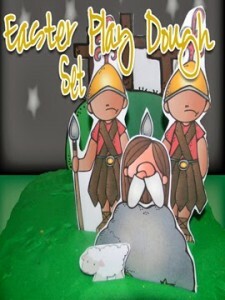 Click here to download the Easter Play Dough Set. These are so great!! I love your style of artwork. Thank you so much.